As the main partner of the Fête des Vignerons 2019, SWISS will be adding an aerial dimension to the celebrations in the festival arena in Vevey on 1 August, the Swiss National Day. The SWISS CS300 currently carrying the special Fête des Vignerons livery will overfly the site accompanied by the Patrouille Suisse, to offer the public a unique visual highlight and further fly the colours of this proud festival partnership. Swiss International Air Lines (SWISS) has committed this year to serving as the main partner of the Fête des Vignerons, a typically Swiss event with which SWISS shares the mission of passionately promoting the rich traditions, the savoir-faire and the terroir of its home country. 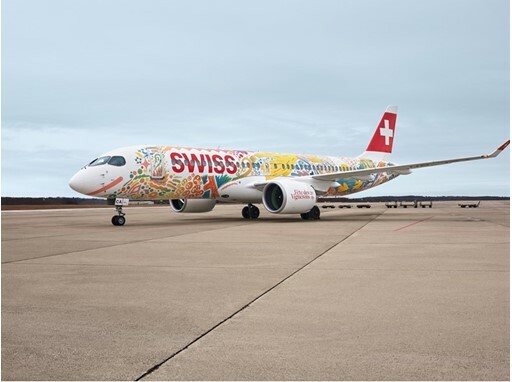 As part of this partnership to pay homage to this living tradition, a special livery created by Vevey artist Mathias Forbach – alias Fichtre – has been applied to one of SWISS’s Geneva-based CS300 aircraft. And this winged artwork will be at the heart of a flypast over the Fête des Vignerons arena in Vevey on 1 August, the Swiss National Day, following the arena address by a member of the Federal Council. The specially-liveried CS300 will take off with its three-pilot cockpit crew and head for Vevey, where it will fly over the Place du Marché arena and Lake Geneva. The aircraft will also be accompanied by the six F-5E Tigers of the Patrouille Suisse, to produce a truly spectacular air show. SWISS’s CS300 will open the proceedings with a solo flypast, before teaming up with the Patrouille Suisse for a joint display. The Tigers of the Swiss Air Force will then perform some of their own hallmark manoeuvres before being joined by the SWISS CS300 again for a final ‘bouquet’.